Thanks to all our sponsors, volunteers and neighbors in helping make this year’s tour such a success. We hope it becomes a part of your future holiday tradition! 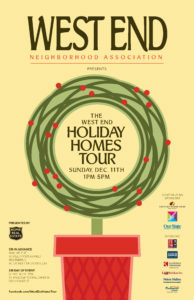 Remember – The West End Holiday Homes Tour is a biennial event, occurring in December of even years. We hope to see you in 2018! 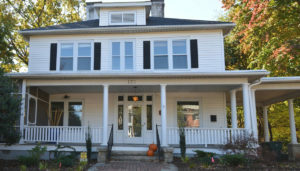 The Maslin family of bankers inhabited this home from 1918 to 1950, and owned the home until 1985 when it was purchased by the current owners. The Maslin's descend from Huguenots that fled Belgium due to religious persecution and arrived in Colonial Virginia. 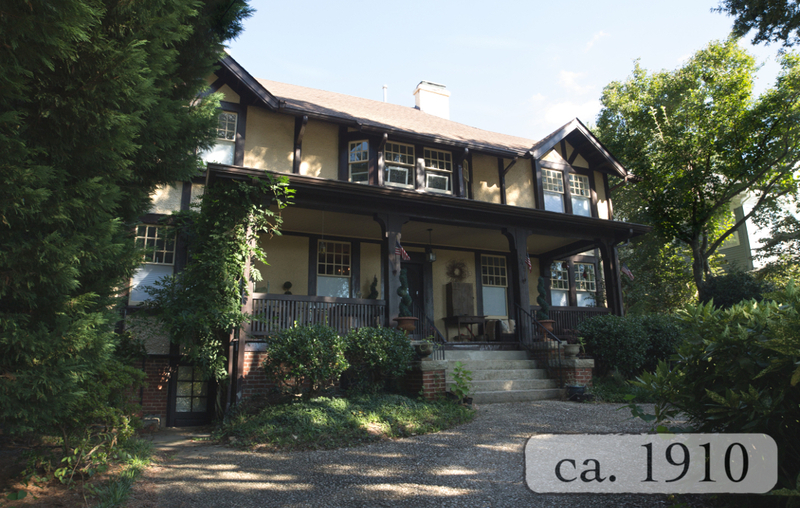 Prior to 1918, the home belonged to Robert and Pearl Horn (1903-1913), proprietors of the R.B. Horn Company, famous for its Southern Belle Chocolates. Ironically, the original owners of the home, the Brock Family (1895-1903), also started a candy company. The Brock Candy Company would eventually grow to be one of the country’s largest candy manufacturers before being purchased by Brach in 1994, and is most famous today for inventing the gummy bear, gummy worm and the modern day fruit snack. In 1909, Carrie Rosenbacher, widow of Sigmund Rosenbacher, purchased and built this home, where she lived with her five children. 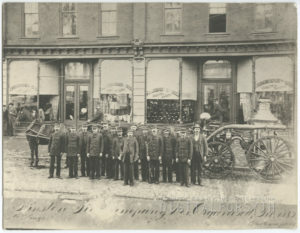 The Rosenbacher’s were prominent merchants in Winston-Salem from the late 1800’s when they opened the first dry-goods store downtown on the corner of Fourth and Trade Streets. "Rosenbacher and Brothers" was a successful clothing store until 1975. 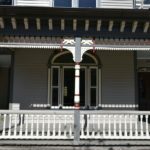 Once it was no longer a single family residence, the Rosenbacher House became home to a number of commercial enterprises including an antique shop, a hair salon, and Michael’s restaurant. 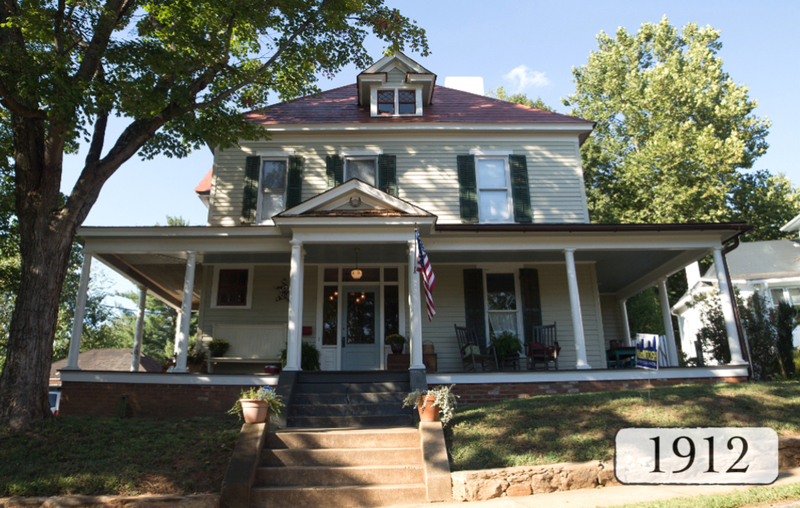 The current owners meticulously restored the home since its last use as a restaurant. 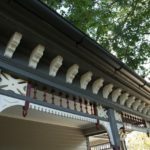 Each feature including the arched pocket doors, the Ionic columns in the front hall, and the leaded windows has been restored in breathtaking detail. The upstairs has been handsomely renovated and serves as the office space for their company LMI Builders. Today the Rosenbacher house is home to the coffee shop and bakery Tart Sweets. Well know for their French macarons and Southern poundcakes, the mother and daughter team operating Tart Sweets also offer catering, special orders and High Tea! The backyard provides a beautiful gathering space for large or small events with a firepit and hardscape. Oscar P Schaub Home at 1211 Forsyth Street, 1912 (inventory property 416). The oldest house on Forsyth Street, this large two-story frame dwelling of simple Colonial Revival design is characterized by a steep pyramidal roof sheathed in tin shingles with side pedimented cross gables, a front pedimented dormer, and a wrap-around porch with Tuscan columns. Perhaps the most interesting use of the home was "Long’s Turkish Bath & Health Center" by Marie Long in the 1940’s. 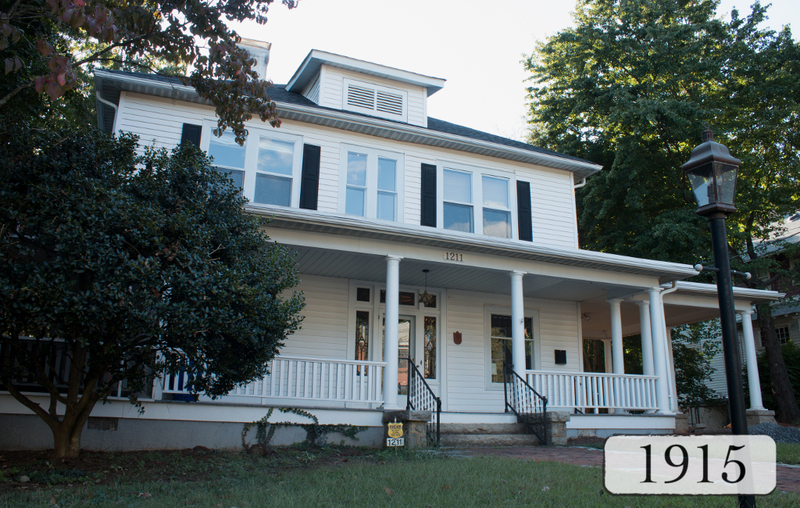 After purchasing the house from Craige in 1947, Eva Long sold it to Fred Pettyjohn, a salesman for Lambe Young Realtors, in 1961. 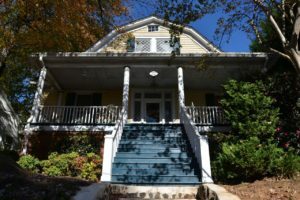 The Pettyjohn family owned and occupied the house throughout the sixties and seventies, and eventually sold the home to its current owners and residents in 2014. 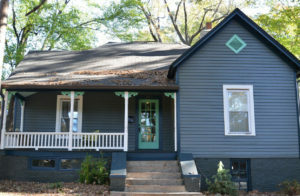 The current owners have spent the past two years returning the home to its original glory, which has included removing siding to expose the original historic details of the exterior, removing the additional kitchen on the front porch, restoring the tin tile roof with original matching tin salvaged from another home, repairing original wood floors and replacing the master bathroom floor using salvaged hardwoods, and renovating essentially from the foundation to the roof thanks to years of extensive termite damage. A beautifully crafted staircase addition on the second floor, an inspiration of the home’s current owners, now leads into the attic area on the third floor, providing a cozy living space and lookout onto the street below. French doors in the kitchen, as well as beveled glass windows and original shutters now embellish the home with their original charm after being rescued from their burying place deep within in the garage. 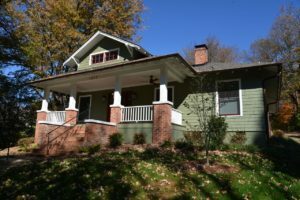 Custom milled cherry cabinets in the kitchen and salvaged street car era handmade bricks on the patio complete this beautifully restored home. 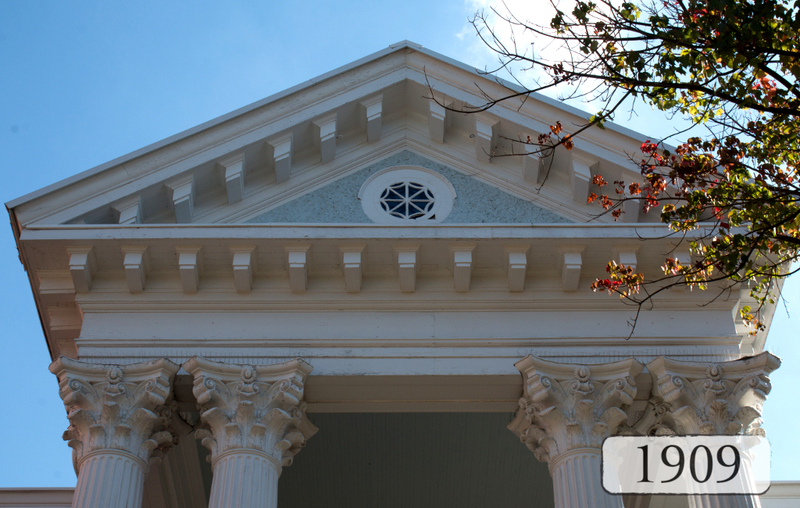 The house was listed in the city directories for the first time in 1915 as the residence of JR and Lula Thomas. Thomas was a coal, wood and ice dealer. They were still at this location in 1918, but in 1923, Henry J. and Myrtle D. Stultz purchased the property for their residence. 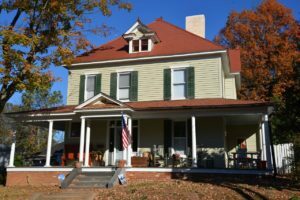 Stultz was a foreman at RJR Tobacco Co. After Henry’s death around 1944, Myrtle continued to own and occupy the house until 1951. 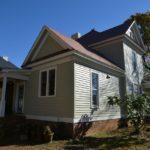 The current owners completely renovated the home prior to moving into the home in 2015. While tradition was preserved in the front of the home, air, light, wood, and clean lines were brought into the rear of the house by removing the roof over the kitchen, replacing the back wall with glass sliding doors, and building a master suite above. The open kitchen, featuring a honed marble island and handmade cabinets, continues into the garden with a walk-out deck overlooking a giant Magnolia tree in the backyard. Upstairs, the master bedroom was converted into a large bathroom with an open shower, mother-of-pearl tile, and beautiful bocci accent lights. A new cozy master bedroom opens up to the treetops with a small balcony. 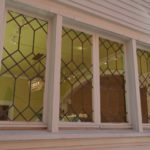 A second upstairs bathroom was completely renovated with care taken to preserve the stunning stained glass windows. The upstairs sleeping porch has been fully climate controlled. 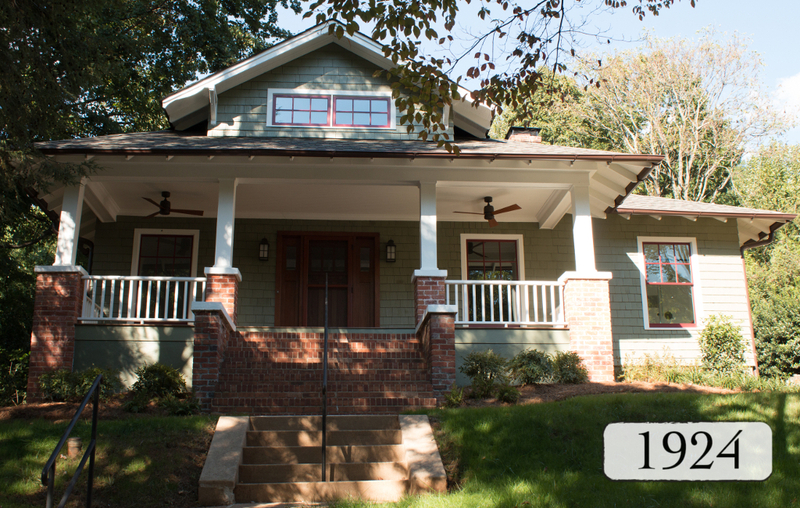 A notable feature of this lovely home is the screened in side porch that offers a private and quiet respite. 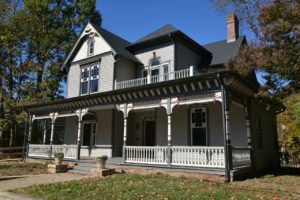 The house was built by the Southern Development Company, a West Virginia corporation, according to the owner survey form on this property. William J. Roberts acquired the property in 1911, and in 1912 he and his wife, Sallie, were listed in the city directory at this location. Roberts was manager of the RG Dunn and Company, a local mercantile agency. In 1935, Paul H. and Thelma Lehman purchased the house for their residence until 1979. Paul Lehman was an employee of PH Hanes Knitting Co. Mr. Everett Lehman, son of Paul and Thelma and current resident of Pfafftown, moved into the home with his parents in 1935 when he was 2 years old. Mr. Lehman remembers the sale price of the home originally being $7500. His father declined to purchase the home for more than his budgeted $3500. His offer was ultimately accepted. 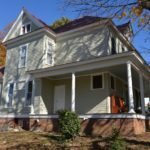 Current owners have restored the stone front steps, replaced much of the front porch and front stair railings, and finished the attic for effective storage. As you tour notice the unique built in oak cupboards in the mantle over the den fireplace, and the West End Association logo displayed prominently in the stained glass transom between the foyer and living room.This custom panel was made by the grand father of the previous owners, the Brian Efird family. 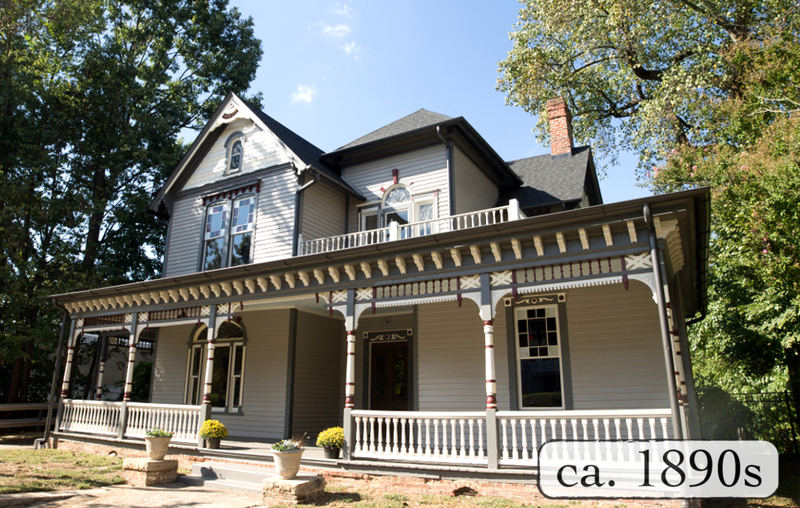 For much of its history the house appears to have been used as a rental property. The longest owner-occupant was Mildred F. Bennett, who owned the house from 1939 to 1980. Today, this house is being offered as a charming accommodation on Airbnb by the present owner who has lovingly removed false ceilings in the rear of the house and restored it to its original height, regained a stone wall in the rear yard, and added decorative touches to bring a modern, whimsical twist to this darling home. 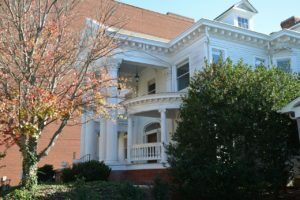 Wortham Wyatt, a dermatologist, and his wife, Blanche, were the original owners and occupants of the house. 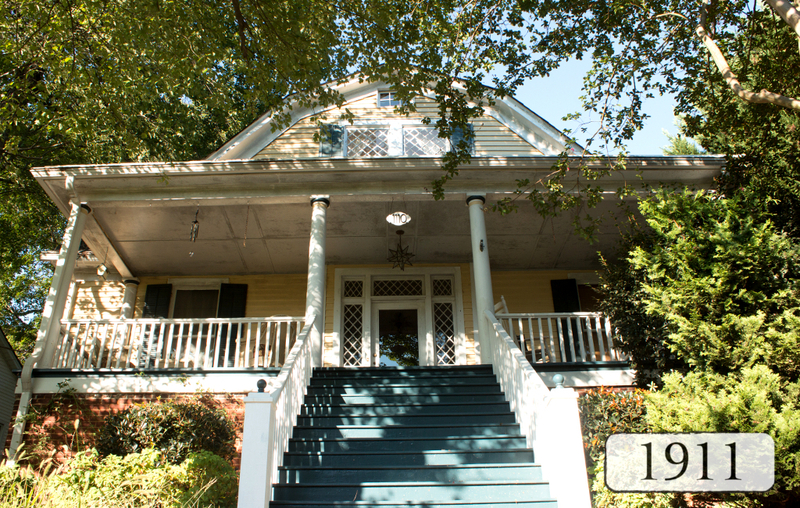 In 1955 Blanche Hyatt sold the house to Thomas & Lucy Honeycutt. 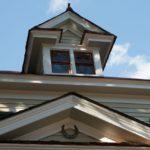 It has been lovingly modernized by its current owner who took this house all the way down to the studs to begin the rebuild. The beautiful mahogany front door gives a lovely introduction to woodwork finishes throughout the house. A custom kitchen invites you in but look for the tucked away reading nook as well as a custom murphy bed disguised by a wall of storage. The master bedroom boosts a wine cellar accessed by a secret stairwell in the master closet and is something you shouldn’t miss! 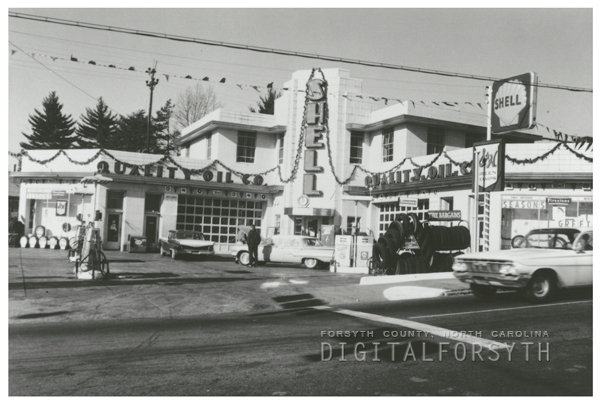 In 1959, after spending more than twenty years at this location, the Quality Oil Company moved its operations to Peters Creek Parkway, and it is believed that the rear windows of the building were probably sealed in shortly thereafter, as vagrants walking the train tracks had begun to lay siege on the building with rocks. 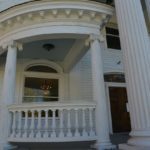 In 2005, JD Castle Corporation purchased the building, and after seeing original photographs of the building from the 1930’s, decided to restore the façade to its original appearance. Today there are three businesses in this property. Salem Smiles Orthodontists occupies the upstairs. 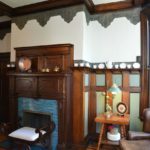 These offices still feature the building’s original knotty pine paneling, hard wood floors, walk in vault, and black and white tiled bathrooms complete with vintage urinals. 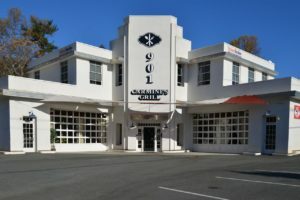 The main garage bay area now serves as the quaint and delicious Italian restaurant Carmine’s 901. The third business located in this historic gem is Winston Salem’s Theatre Alliance offering live theater performances year round. 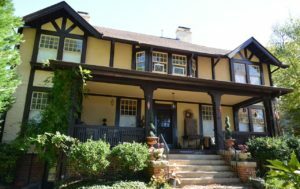 Traffic manager for RJ Reynolds and Vice President of the Board of Trade, Graham prided himself on living in the neighborhood’s largest and arguably finest example of a Tudor Revival home. 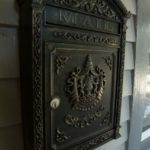 The current homeowners refer to the house as their Grande Dame and have worked diligently and lovingly to restore many of its original features. In the process they have discovered a fireplace and the original kitchen footprint, complete with shiplap siding on both ceiling and walls.